We all dream of it, Chinmayi. And over time it becomes our "happy place", an image that we can meditate upon to make us calm, centered and focused. Where that place is in reality will one day be seen by all of us, I suppose. Some call this place Heaven, others call it Vykunta, other Nirvana. 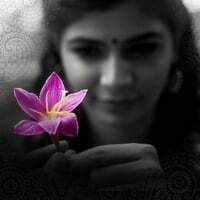 We all are aware of what happened chinmayi,these morons are jobless and yet to have some life..Do not give a damn about these so called citizen-journalists/activists for most of them are fake and don't have a real face either...Time will heal and try to move on - Big fan ! I cant even imagine the turmoil u n aunt go thru now. We pray God that everything should be alright. At the end its not between u and them but between u and God, who knows ur thoughts and all the truth in the world coz no one need to tell him. It will be fine. Take care. ...silver streaks replaced by liquid gold.......romba azhagu....!